A helicase enzyme moves along DNA in small steps to unwind the two strands. 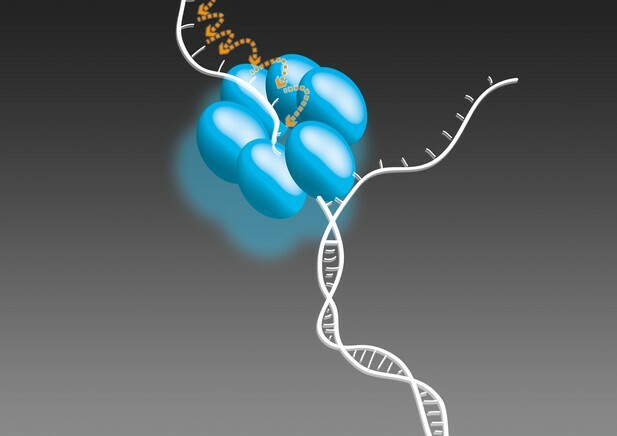 Living cells store their genetic code written in molecules of DNA, with two strands of DNA twisted together to form the familiar double helix. When a cell prepares to divide, it must unwind its DNA so that the individual strands can be copied. Enzymes known as DNA helicases play a vital role in this unwinding process; yet, it is not completely clear how these enzymes move along the DNA. Schlierf et al. have now developed a new approach to see how an individual DNA helicase called G40P unwinds the DNA double helix. The experiments used a molecular ruler to measure the DNA unwinding and showed that the helicase opened the double helix one letter of genetic code at a time. Also, specific sequence of letters within the DNA molecules could slow down and stop G40P or even cause it to move backwards. DNA helicases work closely with other proteins inside cells to perform their task. DNA primases, for example, are enzymes that create the starting points for making new strands of DNA. Schlierf et al. found that the primase DnaG could also prevent G40P from moving backwards on the DNA, a new and unexpected function of DnaG. These findings contribute to an ongoing debate among researchers with partially contradictory models for how DNA helicases unwind the DNA double helix. Although originally from a virus, G40P is similar to a helicase enzyme found in bacteria. Therefore, a better understanding of this helicase may lead to new ways to stop bacteria copying their DNA, which might one day become new antibiotics to treat bacterial infections.